Fully-coated with nitrile and featuring a safety cuff, the Marigold Industrial Nitrotough N660 Heavy-Duty Nitrile-Coated Gloves provide protection for manual tasks with the risk of cut, tear, abrasion and contact with oil. 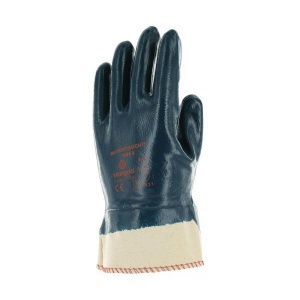 These durable, yet flexible, gloves can be used for various applications in greasy and oily environments, and are ideal for use in the automotive and construction industries. The N660 Gloves provide excellent abrasion resistance, offer a degree of protection against cuts, and are oil-repellent. This makes them suitable for use in oily environments and for various manual tasks. They are suitable for a wide variety of tasks, particularly in the automotive and construction industries. The table below shows the test results of the Nitrotough N660 Gloves according to EN 388 Mechanical Risk specifications.